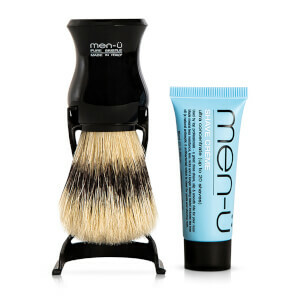 Experience the ultimate close shave with the men-ü Barbiere Shaving Brush and Stand. Combining the perfect balance of resistance and softness with the ability to raise the beard and generate a fine, rich lather, the Italian sourced set will leave you with a smooth, exfoliated complexion. Sourced from Italy where they supply the traditional barber with the finest shaving brushes, the set comprises a pure bristle shaving brush with a storage stand, and a 15ml tube of men-ü Shave Crème that offers up to 20 shaves. It’s recommend that you dry your brush by hanging on the stand provided. This is because the bristles should always dry facing down, rather than up into the handle. Not only is it more hygienic, but is also helps prevent the bristles from falling out.